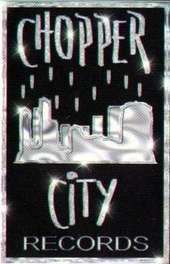 Chopper City Records is a record label founded by CEO and rapper Christopher "B.G." Dorsey and Co-CEO Carol Dorsey in Metairie, Louisiana. Dorsey, signed an independent deal for his Chopper City Records with Koch Records in 2003. After Hurricane Katrina, Chopper City Records had relocated to Detroit, Michigan but later relocated back to Louisiana in Destrehan. B.G. and the roster completed their contracts with Koch in 2007 and B.G. signed a solo deal with Atlantic Records. B.G. recently changed the labels name to Chopper City Music. In 2010, B.G. released the " Moneyside / Murderside" mixtape which heavily featured C.C.G.G. ↑ Soren Baker (December 30, 2002). B.G. Kicks Drugs, Doesn't Need Baby's Birdfeed To Make Livin' Legend. MTV. Accessed November 13, 2007. "Tha Block Is Hot "